Under-fire rail firm Govia Thameslink Railway (GTR) has become a taxi service to ensure pupils get to exams on time after cancelling hundreds of trains. In a briefing, the firm told staff it would be providing taxis and buses in "key locations" to support students and "key schools" had been contacted. 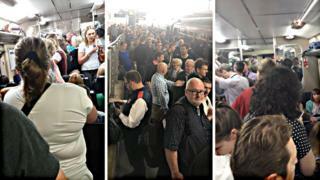 It comes after services were cancelled to deal with a new timetable that caused chaos on lines across the UK. GTR said its recent timetable change had required a phased introduction. The "key locations" include Letchworth and Hitchin in Hertfordshire, Cambridge and South Croydon. GTR said it would not be sharing the names of the schools in question. Many pupils are sitting GCSE and A Level exams this month. In the letter leaked to the BBC, the firm - which runs Great Northern, Thameslink and Southern - confirmed the taxi scheme will run until the end of June. Some took to Twitter to vent their frustration about train cancellations during exam season. @SouthernRailUK poor service, cancelled trains middle of Year 11’s GCSE exams, they don’t need more stress! Mum taxi to the rescue, late for exam & work! The move comes after GTR boss Charles Horton admitted on Wednesday being delayed by his own trains and said "some trains have run on time and others haven't. I'm sorry about that". The new timetables saw the timings of every train changed, in a shakeup billed as the biggest in the UK. It came into force on 20 May, but was immediately criticised by passengers and unions, including the RMT, which said there was "a hopeless lack of planning, combined with a shortage of crew and fleet". Transport secretary Chris Grayling criticised Network Rail and GTR for "collectively failing". But on Monday, Labour's Lilian Greenwood, chairwoman of the Transport Committee, asked why Mr Grayling would not "take any responsibility for his department's role in the shambles endured by passengers up and down the country". A GTR spokeswoman said the phased introduction of the new timetable had led to planned cancellations on about 230 of 3,600 daily services. She said: "While we try to schedule these during off-peak periods, it isn't possible to only do this and we are aware that students are currently taking school examinations. "Therefore, by working with our station teams, we identified areas where high numbers of students use our services to get to their school and put contingency measures in place to support them if there is a gap in the planned service." She said replacement bus services were on standby and station teams were on hand.